Peyton is now almost four weeks old. Hard to believe! Both Austen and Adler are adjusting to having a little sister. Adler likes to sniff and lick Peyton but pretty much leaves her alone otherwise. Austen is growing increasingly more interested in his sister but for the most part goes about his day and ignores her. He likes to help for a bit of the time – getting her bottle or helping to get the items she needs for her bath and getting his stool so he can watch her/see her get changed or washed up. He did hit her in the head with a ball this week (it was a soft one) and earned a spot in timeout for it only because I had repeatedly told him to stop throwing the ball around her. And, let’s see yesterday he almost dropped his toy school bus on her head and lost his balance when throwing Adler a toy and almost landed on her in her bouncy seat. So a lot of near misses. I’m sure at some point they won’t be near misses and Peyton will have to be a tough little girl to put up with Austen (and Adler). So on Sunday we finally had Austen's family birthday party (we planned it later this year so we could have more time with Peyton and I would be feeling more mobile after my c-section). We also usually have it just at our house but decided this year with a newborn that we were better off having it at a local pizza place. Funny thing is that Austen does not like pizza! Of course, we just ordered him something different and the rest of us enjoyed the pizza. Anyway, I was very proud of my three-year-old and the way he sat and opened up every gift and showed appreciation for everything he received including clothes! He also gave everyone a hug, kiss or high five for his presents after each gift was opened. And, this was all without a nap! Austen had a great time seeing all his family and playing with his cousins...he didn't even seem to miss his friends that he thought were coming! Here are some videos from that day. I can't believe Austen is three. It seems like just yesterday that I had him. I'm sure I'll be saying that when he's 10, 20 and 30 too! Anyway, Austen woke up this morning and saw his presents waiting for him by his chair at breakfast. He thought Santa brought him more presents. I guess that's the problem with having your birthday so close to Xmas! It's confusing for a three-year-old! I'm sure by next year he'll get it. Next year, we'll also have to have a "friend" party for him. He keeps talking about all his friends from school helping him celebrate his birthday but we decided to hold off on a kid birthday party for Austen for another year given that we were going to have a newborn. He'll still be celebrating next weekend with family so he'll get to blow out even more birthday candles! I'm sure he'll be fine with that especially with all his cousins there. Austen did, however, get to celebrate his birthday with his friends at school. Tom and I stayed up late last night baking muffins for his classmates. (Cupcakes are a thing of the past - only somewhat healthy treats for kids these days at school! )So his class sang happy birthday to him and Tom said when he got to school this morning, the first thing he did was make a grand entrance and announce to everyone that today was his birthday. No chance that he was going to be overlooked on his special day! Here's Austen opening up his presents this morning and a photo (above) of him telling us he's three! I'm sure you all noticed that my blog has a new name. It's the third name change since I started this blog almost four years ago. It's appropriate as it follows the changes in my life since then. About a year after we were married, we got a dog (Raising Adler). Two years later, we had Austen (Raising Adler and Austen) and now we just added a new addition to our family - a little girl, Peyton. So instead of using Raising Adler, Austen and Peyton, I thought it was better to keep the title simple. Regardless, the focus won't change. I will still be writing about my two kids and our dog. Only now, I'll have more material with one more child. Anyway, Peyton was born last Wednesday, December 30th. The birth was much easier this time around since I was scheduled for a c-section and didn't have to go through labor. What a blessing that was. I felt more alert and certainly knew more of what was happening this time around. When they pulled her out and said "it's a girl!," the first thing that Tom said was "I don't know what to do with a girl, I grew up with three brothers!" My first thoughts/words were "I told you!" I felt like she was a girl. Not because my pregnancy was much different this time around and it was (harder I would say) but because of my dreams. Before Austen was born, I had three dreams that he was a boy. This time, early on, I had a dream that it was a girl and then one about two weeks before I gave birth told me again it was a girl. So I was pretty confident it was a girl. 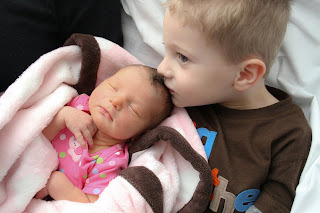 Austen met his little sister on New Year's Day. He visited the hospital with my mom. I was sitting on the couch on the far side of the room with Peyton. He entered the room, looked at Tom and was about to give him a hug when he saw me and ran to me but immediately halted when he saw Peyton in my arms. He turned on his heel and ran back to Tom and gave him a hug and a kiss. Then he hesitantly approached me and gave me a hug and a kiss and peered down at his new baby sister. That lasted a few seconds before he was mesmerized by the big windows in the room and all the buildings outside. I would say that since her birth, he's been interested in helping to throw away her diaper (one of his favorite things to do) and then just goes about his business of playing with his cars, trucks and trains like he did before. Of course he's had his moments of acting out but he's back to school and his routine, which I'm sure is comforting for him.